Texas rancher and bar owner Cassidy Flynn is shocked to learn the bride's name in an upcoming high society wedding - Cassiopeia Dolmides. Cassidy is a woman of secrets; the deepest is the identity she was born with and thought she had escaped long ago. If this bride is impersonating Cassidy, what trouble will that cause Cassidy and her infant son? Greek tycoon Theron Christofides needs to gain possession of Dolmides Cruise Lines and the little Greek island where it left a shipwrecked eyesore. A lot of people are at risk without his intervention. Old man Dolmides will sell on one condition: Theron must marry Dolmides' illegitimate daughter. Seeing no other way to rescue the island's people, Theron agrees to sacrifice himself and his future. As Theron stands at the altar with his bride-to-be, a fiery-haired woman in snakeskin boots and a cowboy hat interrupts their vows by calling his bride a fraud. In order for the wedding to continue, Theron must convince Cassidy Flynn to drop her lawsuit. Can he withstand Cassidy's allure while he gains her cooperation? Or will they both be consumed by the fire of desire? Pyrotechnia Mikros - Firebrand/Firecracker Galore! What made the experience of listening to The Counterfeit Bride the most enjoyable? All the dramatics so ably represented by the narrator. The fiery personality of Cassiopeia and her theatrics at the wedding and it was go, go, go to the end. Miss Cassidy Flynn does not know how to back off, she took on the might of her natural father and won. I also fell in love with her feisty personality. She was just incorrigible. Theron met his match. Haven't come across any of Pyper's other performances but I really liked her narrations. She expertly mimicked the various characters' accents and their thoughts were mirrored in her voice rendition. A very expressive voice. I'm impressed. When Cassidy spoke of her torment in her own home as a teenager, and her ordeal by her scumbag uncle and the ensuing hospital stay. It was heartbreaking. I loved how Theron was there for her at her revelation. This book keeps you on edge, a roller coaster ride, that keeps your interest to the very end. You just want to see what is coming up next. I love the excitement. Cassidy's strength, her utter devotion to those she loves, and the devotion of her friends to her. Despite her childhood or because of what she really learned during it, she gave back to special needs children on her ranch. And then there is Theron, he makes you salivate just reading about him!! Well developed and believable characters, a great story line, romance, adventure separation, and reunion for a happy ever after. Happy listening. A good story that kept the pages turning late into the night. There are some editing issues and a few scenes that didn't make sense. Would have appreciated more explanation after the kidnapping along with what if any communication was made with TX friends. And again when Cassidy returned home for reconciliation. I could not get past the first 5 minutes. The string of bland words are not made any better by an overly dramatic narrator with a piercing voice that attempts seduction. Simply Awful! 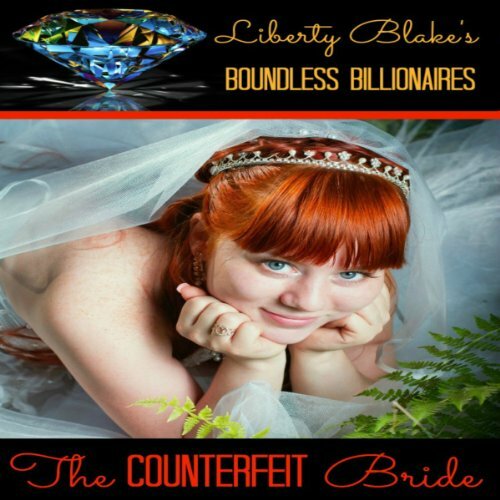 I really loved this and all of the Boundless Billionaire books by Liberty Blake. When are they going to do the others on audible books? It is so much more enjoyable to listen and read at the same time.